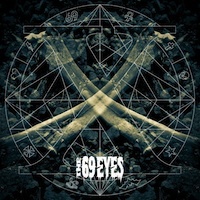 'X' is the 10th album from the Finnish bloodsucking Goth metal-heads in The 69 Eyes. I loved Sister Of Mercy's melancholic dark rock in the good old 80's and The Cult's classic sound in the great: Love (85), Electric (87) and Sonic Temple (89) albums. Since these bands faded from the dark rock heaven, new powerhouses, primarily from Finland adopted the black rock scene. HIM and their antagonists in The 69 Eyes are the ones that developed the black, dark and gothic metal sound since beginning of the 90's. The intro track 'Love Runs Away' is a great heavy metal track (for a gothic metal band most positive sense). 'Tonight' is a typical song from the Finns with strong guitars and strong choruses. Jyrki's unique vocals are the strong trademark for the band and on the best track on 'X' 'Black' I become nostalgic! This is a great slow-tempo track from the dark quintet with hard beating pace. I just can describe it as strong as hell. Next tune on the list is the awesome 'If You Love Me The Morning After', which is a guaranteed sing-along song on the future live scenes! Mega cool chorus. The pre-released single from the album was 'Red' and it's another slow and powerful song with strong lyrics and heavy guitars. In the 'closest-to-a-The Cult-track' genre is 'I Love The Darkness In You'. I like it with it's heavy swings and playfulness. Hey, I thought that Jonny Cash sang on 'Borderline', ghostly pitch by Jyrki. 'I'm Ready' is a straight forward rock track without something extra. The heavy and dark track 'I Know What You Did Last Summer' is a neat and beautiful song it's one of the best on 'X'. The calm and sensitive closing track 'When A Love Comes To An End' fades out, it feels like I got a hearty round of Goth metal inside my vest. A very fat and flawless production makes this one of the discs that is closest to my heart this month. If you are already a fan of the genre, don't hesitate! Just Buy! The 69 Eyes lineup: Jyrki 69 - vocals, Bazie - lead guitar, Timo-Timo - guitar, Archie - bass and Jussi 69 on the drums.